In these times of economic uncertainty when financing is sparse, investors need to look for alternative strategies and financing options for their portfolio companies. In this session, we will explore various options for non-dilutive funding rounds, including evaluating the many options for utilizing their intellectual property. Currently, there are few viable options for easily transferring IP. The Ocean Tomo Patent/Bid-Ask (P/B-A) platform was created to address this problem. P/B-A is the first web- and voice-enabled marketplace that allows buyers and sellers to submit offers to buy (“Bids”) and sell (“Asks”) any of the 33 million plus patent assets, or any combination thereof, across 81 countries and patent-issuing authorities in a completely transparent fashion. By creating a liquid market for IP assets, implementing contract standardization, and providing market participants with access to market data, IPXI will facilitate a deeper understanding of the economics of innovation. 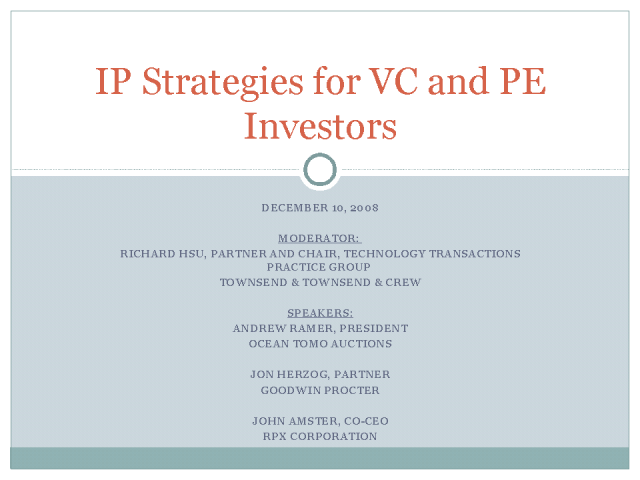 Join Ocean Tomo, the leading Intellectual Capital Merchant Banc® firm, in exploring IP trends related to expert testimony, valuation, investments, risk management and transactions.